Our 50th Birthday Mason Jar Mint Favors are always a big HIT and we're sure they will be a big hit at your 50th Birthday Party! Add a festive touch to your celebration with our Mason Jar Mint Favors! These mints are are fat free, Gluten free and are proudly made in the USA! Mason Jar Favors and Edible Favors are so popular right now, so why not have the best of both worlds! Give them out to your friends and family and they will love them! Perfect for a man's Birthday or a woman's Birthday! Our Mini 5oz. 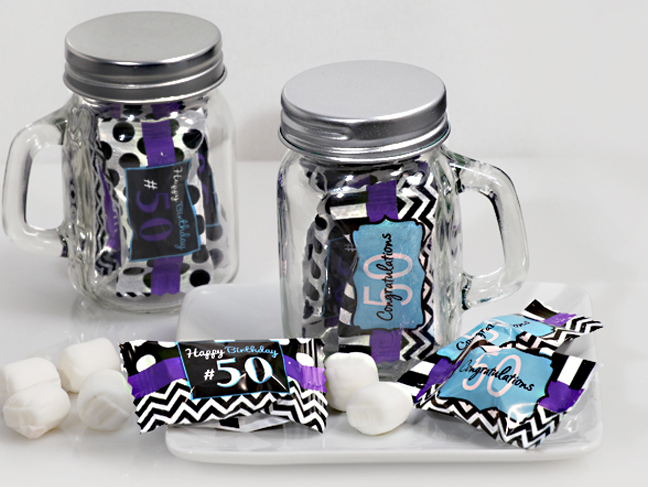 mason jars along with our tasty mints combine to make one awesome 50th Birthday Favor! 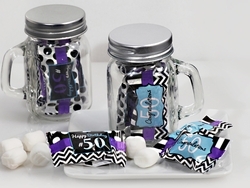 Each 5 oz Mason Jar Favor consist of four individually wrapped mints with a unique assortment of wrapper patterns to compliment your 50th Birthday Party theme.